To kick start this scrumptious feature, Elle is going to take you step by step today to create these stunning snowflake meringues using our free template. This is a perfect bake to do over the Christmas holidays for those cosy days inside! Add a little sparkle to your Christmas feast with these delicate little meringue snowflakes. These can be used as an edible garnish for a warming winter hot chocolate or to add extra crunch and flourish to a dessert. A collection of these snowflakes packed into a bag makes a thoughtful homemade Christmas gift also. We've provided a free printable template to help you nail those piping skills. 1. Preheat oven to 200° C/185° C fan/Gas mark 6. 2. Spread the caster sugar evenly onto a tray lined with silicone paper. 3. Place the tray into the oven for around 5 to 7 minutes until the sugar begins to melt around the edges. 4. Whilst the sugar is heating, place the egg whites and cream or tartar into the bowl of an electric mixer with a whisk attachment, when the sugar is nearly ready begin whisking the whites at high speed so they begin to foam. 5. Carefully add the hot sugar to the egg whites a spoonful at a time. Once all the sugar is combined continue to whisk the meringue until the mixing bowl is cool and the sugar dissolved, this can take up to 10 minutes. 6. Reduce the oven temperature to its lowest heat setting, around 110°C/95°C fan/Gas mark 1/4. 7. Trim the tip from the piping bag to create a hole around 1.5cm in diameter. Position the piping nozzle into this hole and transfer the mixture to a piping bag. 8. Place the snowflake template underneath a sheet of silicone baking parchment so the design is visible through the parchment. Dab a little olive oil onto a piece of kitchen paper towel and spread this over the parchment, this will prevent the snowflakes from sticking and make them easier to remove from the paper once baked. Carefully trace over the design to create your snowflakes. The thicker the line of the snowflakes the stronger they will be. Once piped, transfer the sheet of silicone onto a baking tray. 9. Sprinkle over the caster sugar to add extra sparkle to the snowflakes. 10. Position the baking tray in the lower half of your oven. Bake the meringues for 25-30 minutes until firm to the touch. Turn the oven off and allow them to cool down completely in the oven. 11. Use the tip of a palette knife or a sharp cooks knife to slide underneath the snowflakes and gently lift them from the silicone paper. Ensure all your equipment is very clean and dry, any dirt especially grease and oil will fight with the protein in the white for air and cause the meringue to collapse. For best results use fresh eggs, protein in the egg white breaks down with age. The addition of hot sugar provides a very stable meringue base and can be used all year round, meringues aren't just for Christmas! When piping, hold the bag between your thumb and index finger, apply pressure with your fingers so the meringue flows easily. This will give you the most control and therefore the best results. Egg whites freeze very well, if you have any leftover when cooking freeze them for rainy day baking. Egg yolks break down when frozen which renders them useless. Ideas for using up egg yolks are carbonara sauce, omelettes, mayonnaise, lemon curd and custard. What a lovely bake to make this Christmas! This delicate and delectable treat will be wonderful to share with your family over a nice, hot drink. We have tried them in the office and they are to die for! 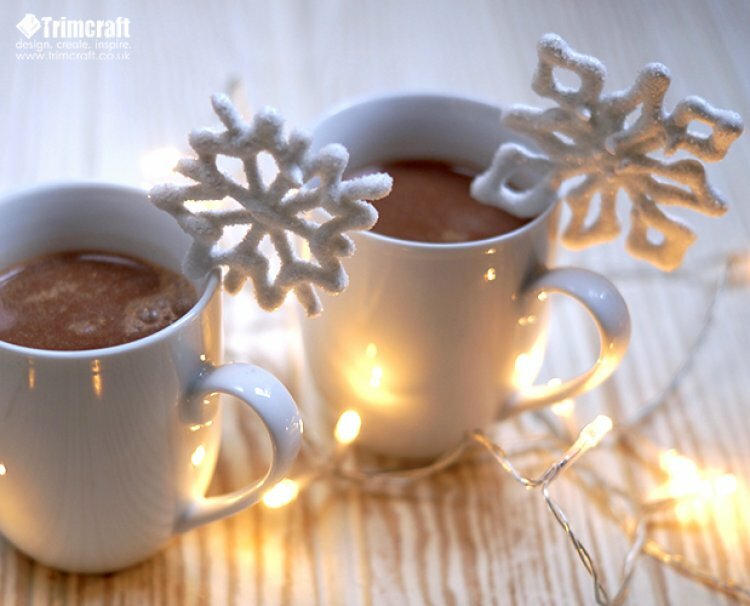 We would love to see your snowflake meringues so remember to upload them to the inspiration area and to #trimcraft when uploading to social media.